I had heard from the waiters at the restaurant Samaria the previous night that the boat from Chora Sfakion to Paleohora wouldn't arrive to Paleohora until. 6 pm. I was furious! 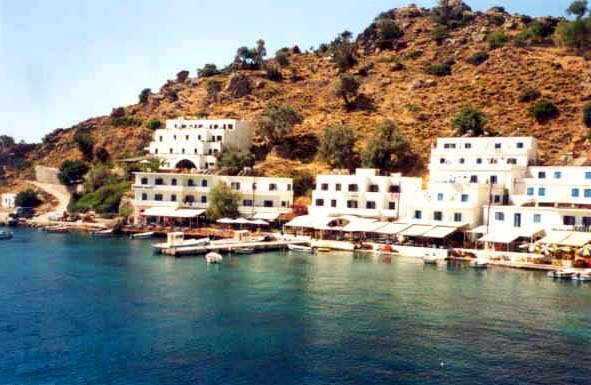 I would have to wait at Agia Roumeli for several hours before getting to my final destination! My head was full of different options for replacing this one but they all seemed bad options. I could take a bus to Chania and then on to Paleohora, I could take the boat later today and wait less time in Agia Roumeli but I would still have to wait. I could spend my time in Agia Roumeli, I could trek the Samaria Gorge, or I could just wait and see. I decided to go with the 10.30 boat and this was full of trekkers heading for Samaria Gorge. 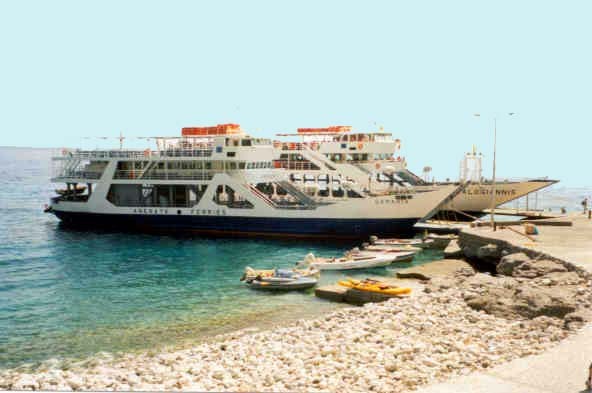 The boat made its first stop at Loutro where it picked up even more passengers. Loutro seemed like a funny place. It was only a short stop but I noticed how all the houses in this village looked exactly alike and I mean exactly identical. All houses were like from the same mould, they were the same colour, white with blue doors and window frames, and almost the same in size. The only difference in these houses was the signs designating the house being a hotel or a restaurant. They had used different kind of letters in the names. Weird! From Loutro we continued to Agia Roumeli where we docked at noon. I didn't feel like going to see and trek the gorge, so instead I headed to the beach. The beach here is almost black in colour, it's very hot and uncomfortable. After two hours I took my bags and again headed back to the harbour. I found a nice looking restaurant by the dock and went there for lunch. The restaurant is called Tara and was a very nice place to be waiting for my journey to continue. I didn't even notice how the restaurant was getting more and more crowded by trekkers as the departure time got closer. At quarter to 5 pm we departed again. Now it was only one and a half hours to Paleohora.